As Southern Ontario’s Centre of Excellence for French-language and Bilingual Postsecondary Education, our integrated approach to bilingual liberal arts education is unique in Canada. 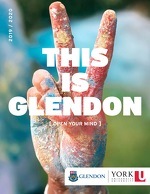 Students at all levels of French proficiency ‘ from true beginners to the more advanced ‘ have a place at Glendon. Our bilingual, multicultural campus provides the ideal setting for language learning. Does everyone study some French? Oui ! Every student that graduates from Glendon has reached our minimum requirement for a Bilingual BA : a solid, intermediate level of French. Our small, close-knit campus offers you a unique bilingual environment where your French will improve on a daily basis just by being here. You’ll hear French from other English speakers practicing their second language on campus, and from francophone students of various backgrounds: about 1/3 of our students come from French-speaking locations around the world — Quebec, France, Belgium, Morocco, Cameroon, Haiti, and Mauritius, to name just a few. Many of them are at Glendon doing the same as you, but in the reverse: learning English while they earn their university degree. Our campus is truly bilingual to the core: all Glendon professors and staff speak both languages; our services, library resources, and even our campus signs are offered in English and French. As a result, student life happens bilingually; sometimes, even trilingually. Our student newspaper, campus radio station and student clubs warmly welcome both anglophone and francophone students, while our Drama Studies students put on productions in English, French and increasingly, Spanish at Theatre Glendon. You might also have the chance to help your neighbours in residence with their English while they’re helping you with your French! Want to improve your French competency, but don’t need an extra credit? For this and other non-credit courses for a variety of languages and cultural experiences, the Glendon Extended Learning program is your answer.